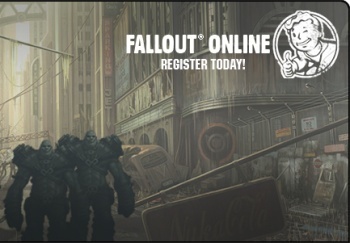 It's official: Interplay's post-nuclear MMOG is called Fallout Online and the teaser site has gone live. Fallout Online is clearly going to be the best MMOG ever, towering over even World of Warcraft. How do I know this? Because the only way the game could even exist at this point is through some pretty determined divine intervention. The Fallout name was dormant for a decade until Bethesda brought it back, yet somehow Interplay, which had been clinically dead for years, not only managed to strike a deal to make the MMOG but then managed to wrestle Bethesda to a deadlock in court. Obviously, some higher power really wants this game to exist. And now it's one step closer to that goal. The near-mythical Project V13 has been unveiled as Fallout Online thanks to a new teaser site that features art, a mailing list and an option to be informed when the beta registration begins. It's a safe bet that some kind of shady backroom dealings took place between Bethesda and Interplay to make this happen, but at this point, nobody's sayin' nothin'. That's the good news. The bad news is that the site is being absolutely clobbered at the moment, so actually getting there and signing up is a pretty dicey proposition right now. Best bet is to try your luck at fallout-on-line.com, wait awhile and try again; really, your best bet is to just forget about the whole thing until sometime next week, but you're not going to do that, are you? If all goes according to plan, Fallout Online will be out in a couple of years. And it will be awesome.